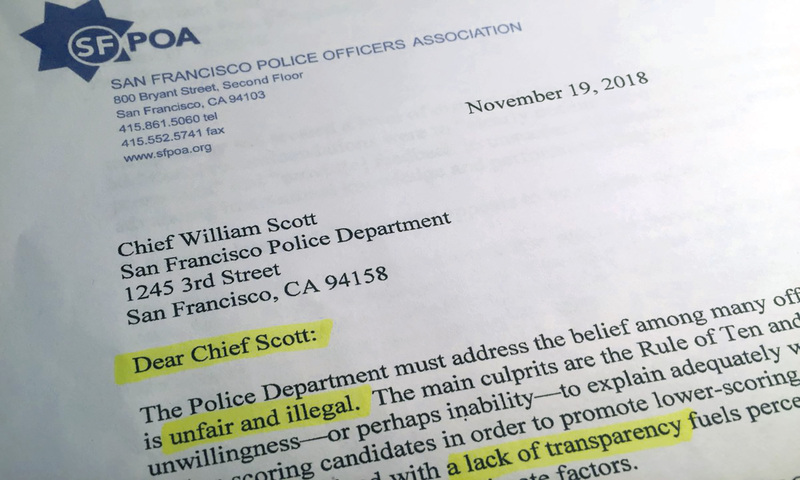 ABC7 News has learned that the San Francisco Police Officers Association has sent a blistering letter to Chief William Scott in the wake of recent department promotions. Many of its members, the union leadership says, believe the process is flawed. The letter from the police union was sent to Chief William Scott after the department released the list of promotions a couple of weeks ago. “Some members are angry, discouraged and demoralized which adversely affects morale,” the letter summed it up. Promotions to sergeants, lieutenants and captains are based on civil service exams. Race and gender cannot be considered. “Different set of experiences, different sets of training, different backgrounds, different cultural competency,” Scott said. And that’s what many in the rank and file object to. They want promotions based solely on how well candidates do on the exam. “Forget the secondary criteria. Like I said, it gives more legitimacy and merit to the testing process,” says Montoya. The secondary criteria, the Chief argues gives more depth to the promotional process. Some officers, Montoya says, believe it also creates room for nepotism. Montoya says he’ll be meeting with the Chief and membership in early December to discuss the situation and assess their next step.